A double-decker bus had its roof completely shorn off when it hit a railway bridge in Essex. 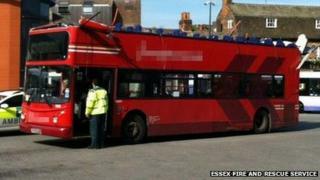 The Regal Busways bus struck the bridge in Duke Street, Chelmsford, at 16:30 BST on Thursday. Essex Police said officers attended, along with an ambulance which took three people to Broomfield Hospital with minor injuries. Essex Fire and Rescue said its firefighters attended the scene but took no action. Greater Anglia train services were disrupted for a short time but have since returned to normal.